Jackie Fo: Busy season...so I'm IPhoning it in! Busy season...so I'm IPhoning it in! I attended Charlotte Fashion Week's Bridal Couture Night as a guest of Say Yes Carolina. I do Social Media work for this wonderful online resource that focuses on all things Charlotte Bridal! Check out our seats, we were literally VIPs. It said it on our tickets. I saw so many beautiful gowns, worn by many beautiful ladies! I've got a ridiculously fun wedding later this month that I've been yammering on about for awhile...you might remember it as the "Pink and Gray Chevron" affair. The bride and I had a big status meeting last week and let me just tell you that the status currently stands as: Extra Fabulous. Soup: I made this spinach, white bean and turkey sausage soup that is perfect for a chilly night. Recipe coming to this blog near you shortly! Up next is Pumpkin Coffee with Pumpkin Creamer. And NO, it's not too much pumpkin because that's not even a thing. You can never have too much pumpkin- just get that in your head and everything will work out just fine. NOTE: Trader Joe's Pumpkin Coffee smells like a pumpkin patch and tastes like Thanksgiving. Speaking of the chilly air, how about the changing colors of the leaves on the beautiful NC trees? My bride Allyson picked her ceremony spot wisely and is getting married under this gorgeous autumn colored tree this weekend. I can't wait to see her rustic and elegant wedding come together! And then I can't wait for us to continue our friendship because frankly, we just click. Right Alley?! This past weekend as I coordinated the very sweet Trish and Andrew's wedding. I can't wait to see more photos and share them on the blog, but for now, my iPhone shots will have to do! Two of my previous wedding couples attended this wedding, and it was so fun to see them! Misty from the fab Misty and Jared wedding was even a bridesmaid this past weekend! Hi Misty! Speaking of happy couples, my double cousin Lauren, who has been featured prominently on this blog got engaged over the weekend! Check out her mega watt grin below! Have you ever seen a smile that big?! Congratulations to Laur and Patrick, I love you! I think it's cute baby time ...yup, it's about that time. One of my co-workers Tina brought in her absolutel precious baby Emery and I basically hoarded him the whole time. We're boyfriend and girlfriend, and everyone knows it. He is a snuggly little guy with the prettiest eyelashes I've ever seen! Just look at us, don't we make a darling couple? In other related cute baby news, my niece has actually gotten cuter, as if that's possible. 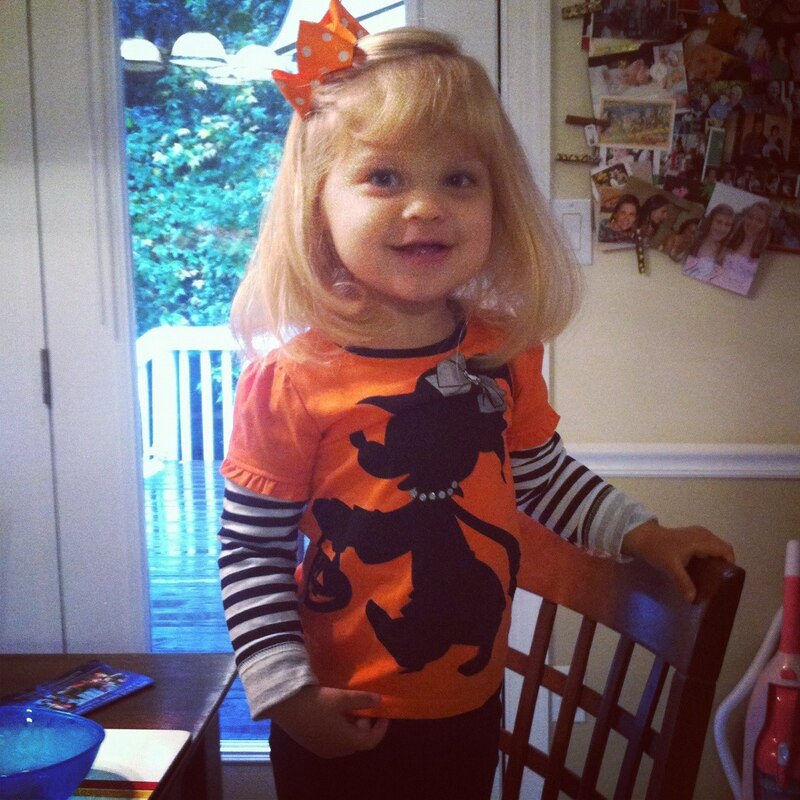 Here's Brooke wearing a Minnie Mouse Halloween shirt to "pwe-school" (as she calls it). Side note the shirt is from Tarjay and it was an excellent purchase - shout out to myself for knowing a solid purchase when I see one. Brooke loves it and I think we can all agree, she looks like a straight-up fashionista with a festive holiday spirit. She's also recently informed me that she likes "Dwesses" more than pants, which pretty much seals the deal that she's' my mini-me and favorite person. In final baby news, I got my own little baby this weekend...a brand new MacBook Pro laptop to replace my "heavy as a freaking brick" PC. Yes, I went to the dark side and am fully immersed in all things Apple. My new laptop (aka BFF) is named Melvin, after the kind gentleman named Melvin who sold me the computer. Clearly he did a damn good job as I'm currently typing this very bog on a laptop named after him. I see many happy memories between Melvin and myself. XOXO Melvin! That's all for now from my iPhone! I'll be back later this week with another post, and maybe some additional wedding photos from this past weekend. Now on to my next task on the To-Do List...SLEEP! Ooh, a laptop named Melvin! Made me giggle. Definitely looks like you've been burning the midnight oil! Congrats to your cousin and I can't wait to finally see pics of the grey and pink wedding! Trish and Andrew's Wedding Pictures! Alley and Mark Wedding Weekend Preview!